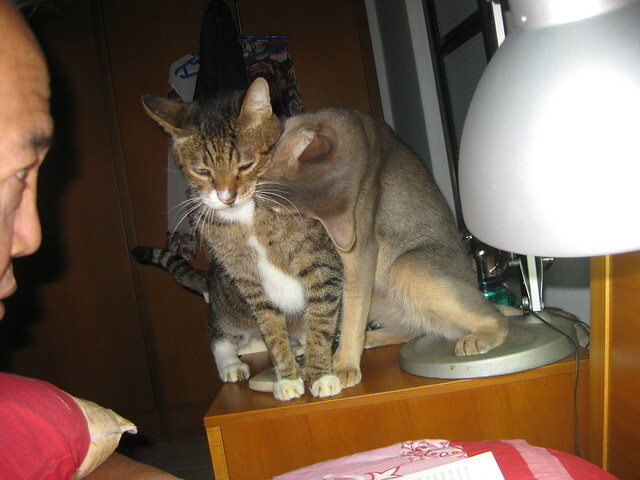 I am sure that you all will be pleased to know the kitties's and Jackie's scrawny necks had not been wrunged. They all loved the new mash. In last report, I wrote of how Sieben while not drawing blood and marrow from me with his needle sharp claws and teeth, Sieben still went to cause misery to me. I never realised the consequences to myself after I showed Sieben the pleasures of tummy rubs in my earlier trying to turn him into a lap cat. Sieben got addicted to that. 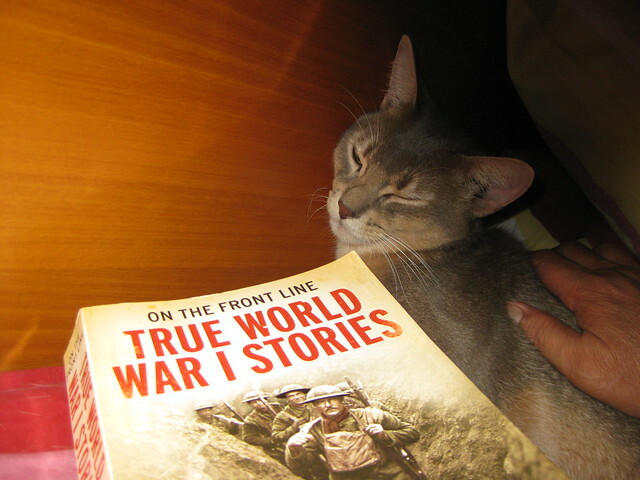 I normally like to read a bit while lying on the bed before I go to sleep. That was when Sieben pounced on me. Crashing his head onto my head regardless of injury to myself. 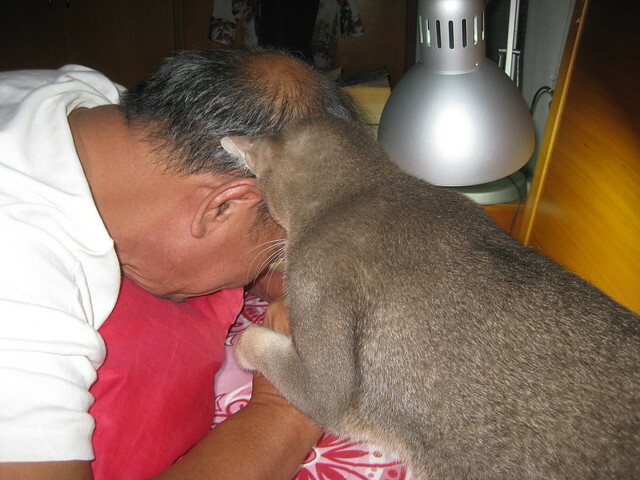 After he knocked me a few times on my head which I try my best to ignore, he would then stick his mouth right into my ear to thunder out his purrs. Concussions and being deafened became the routine I was inflicted with. He would do that a few times before he felt I was primed enough. I had to drag him away by the root of his tail so I could continue to read my book. And to hold him away so his head will not block the pages. He then rolled over insisting on his tummy rubs. With his incessant demands for tummy rubs, Ivan in disgust stopped coming on top of me to do his threading and massaging of me. Ivan came onto the table nearby to look on. 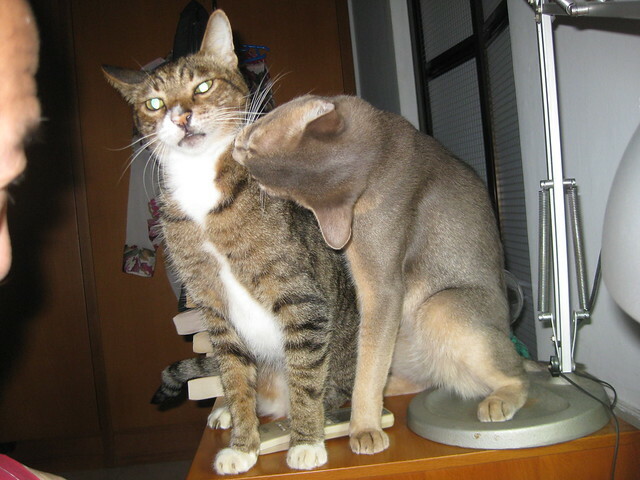 I half hoped he would jump onto Sieben to send him packing so he could be by my head or to massage me. Instead, Sieben would intercept him and tell him to go to the foot of the bed while Sieben took the head. And poor Ivan accepted that. With Jackie full graduation, I thought the road for the 2 of us would be nice and smooth after that. On Christmas day, I was surprised that Jackie refused to respond to my recall cues. He grudgingly touched target. I had to say the night before was stormy and very windy. To the point stuff in his flight room had been blown about and had to be somewhat organised by me again. I thought of my one step forward and two/three steps back as happened now and then with other birdies. Not only was Jackie unhappy that whole day. When evening came, Jackie was reluctanct to go to sleep as he normally would do when light disappeared. 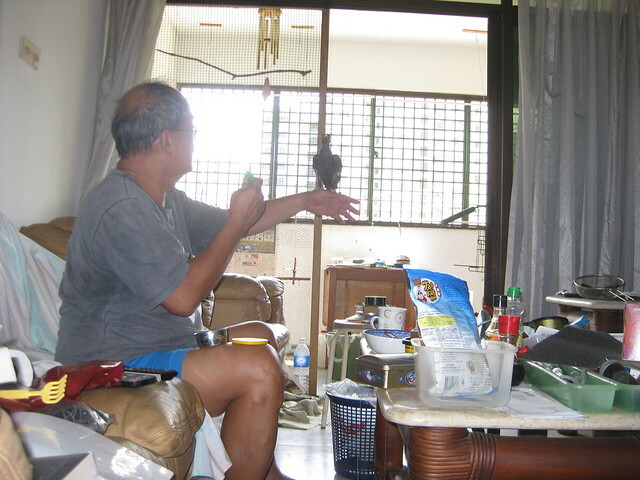 The next day, my wife went to his flight room to offer him pieces of bread. Jackie not only refused to take that from my wife. Jackie even refused to fly to the table where the pieces of bread were left on. That surprised me to the extent I decided to go in to have a good look at him. His mood had been very unusual and I was trying to figure out why. 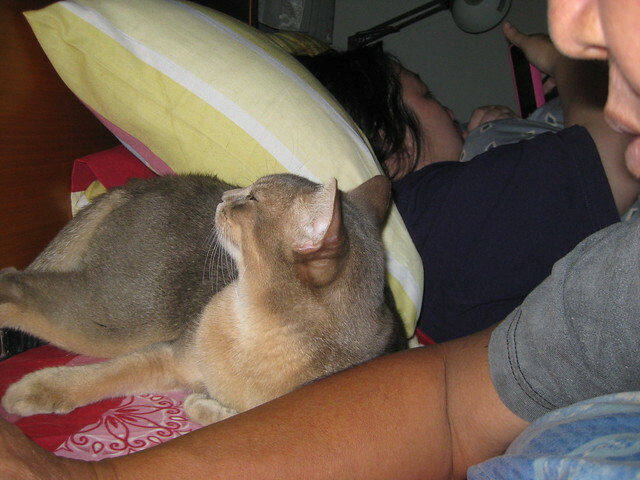 He was agitated with me in his room for a couple of days already and very agitated with my wife in his room. 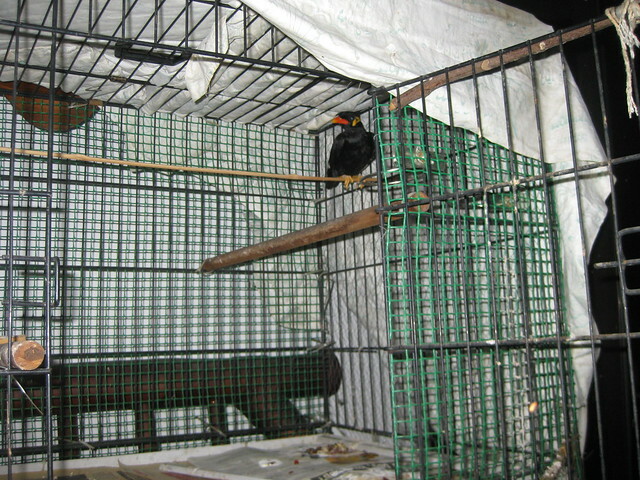 I then saw the perch in his cage had been displaced perhaps by the storm the other night. It was a very thin strip of bamboo just placed on the bar and not tied down. Which was why I had not noticed that before as that could barely be seen from my armchair when I was in the flight room. 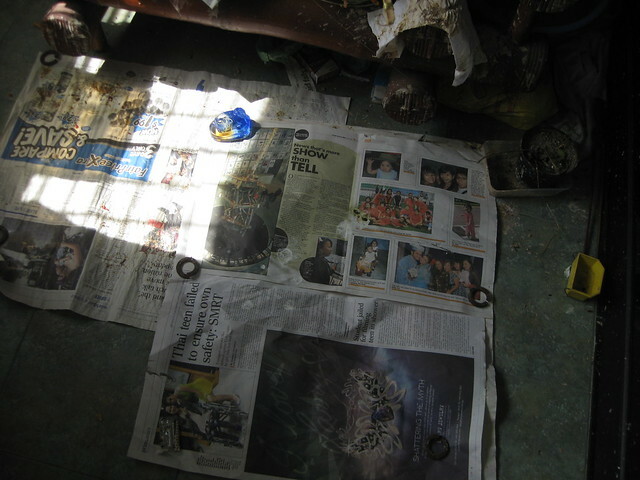 He hardly poop in the cage so I seldom changed the paper in his cage. 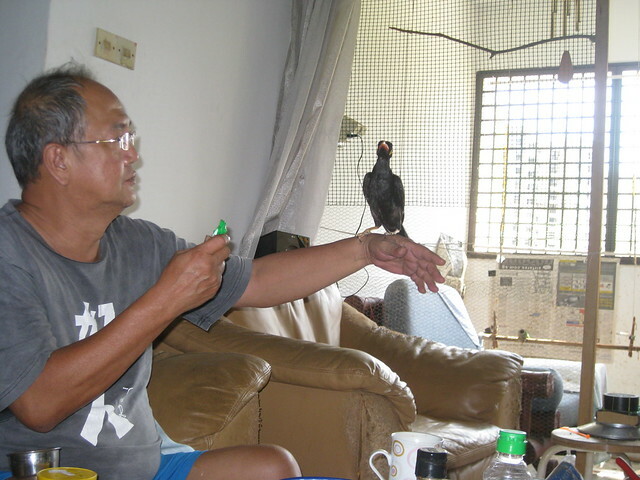 Let us remember the set up was orignally done for Yingshiong, a 30++ gram bird. I knew I should have changed that to suit Jackie, a 180++ gram bird. But you know I was laid back and a procrastinator as well. Since he liked to sleep on a thin strip of bamboo, I thought why bother to change that. 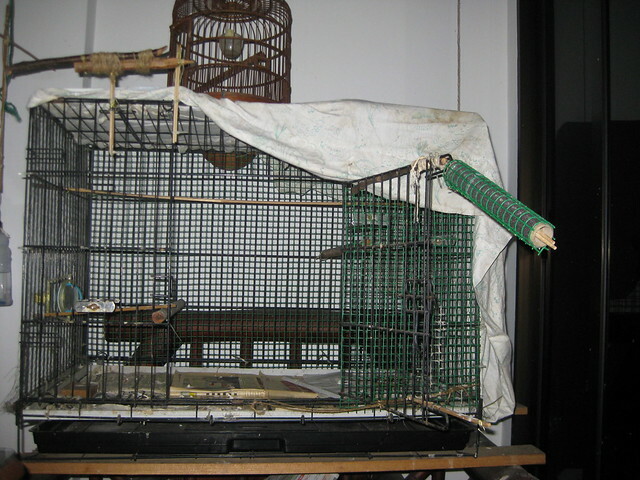 Except the bamboo strip was not tied to the cage and was blown down. No wonder he slept so late for couple of nights. I fixed that perch and tied that to the cage bars so that should not drop again in the future. I had not realised Jackie was angry and throwing tantrums that I mistakenly thought was that one step forward and 2 step back. He showed he loved that by going to sleep 45 minutes ahead of his normal sleep time now that he got his perch back. And the next day, he was back somewhat to normal, flying to me on cue and no more strange tantrums. Note Jackie sleep area not easily seen in upper right corner of cage. Jackie back on his sleep perch. The cloth was to block light from living room. The photos below showed Jackie clearly receiving his graduation scroll. 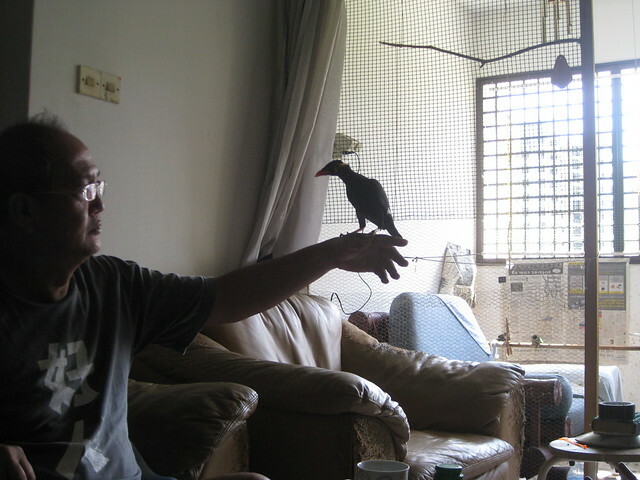 In that he flew into the apartment onto my hand on cue. Not just flying snatches at pieces of bread. In addition to flying to my hand, I had been using the target stick to cue him to walk up my arm almost to my shoulder. Insidious way to get him to get use to me, and walking about on my hand. I still hope for him to fly to me on his own accord, or voilational flights to me that he initiate and not cued by me. 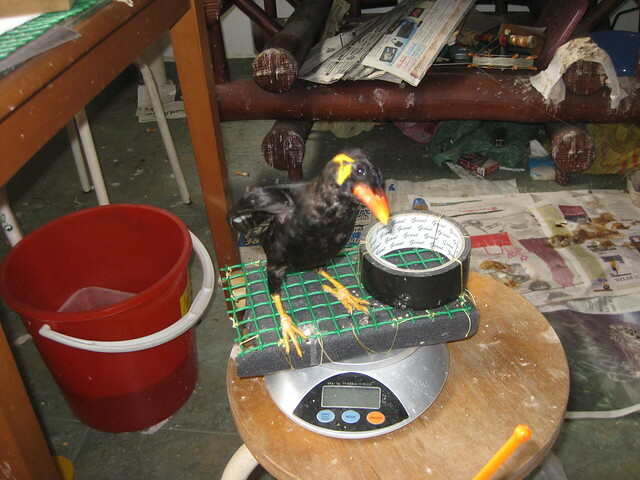 You all knew that earlier on, I had to put a bowl of mash on the scale to get him to fly there to be weighed. The touch target was used to induce him to do that. 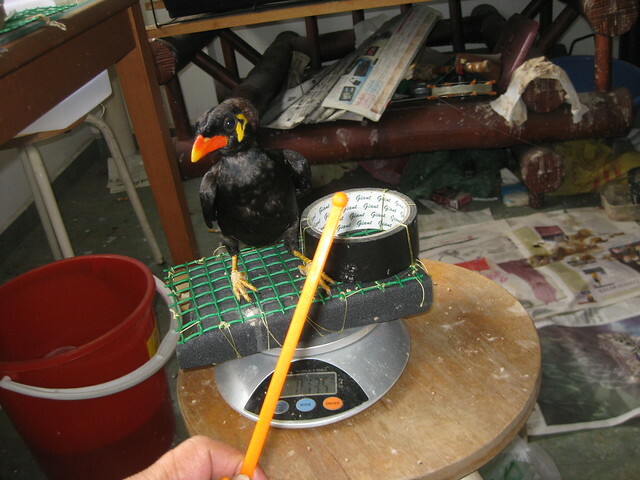 And the cue to scale will be worked in slowly so I could get him to fly to be weighed without using the mash bowl. Jackie now did not mind Ivan at all. Jackie would fly to me over Ivan. Jackie would be on his door perch and accepted calmly Ivan walking into his room and roaming about there. Sieben was a different matter. I decided against locking Sieben in a room. I felt that might forment even greater eagerness in Sieben on the day my eternal awareness proved not so eternal. I felt it better to let them over period of time to know each other and hopefully accept each other as friends. Jackie was also very aware of Sieben. And so was I. When Jackie refused to fly to me, many times it was as Sieben was in the background near me but unseen by me until I turned my head. Sieben remained very watchful. That was ok with me as that was an improvement from his earlier stalking approaches. Jackie response to me was more a function of his mood, Sieben being around, and less on food. I tend to give him food after his weighing and a few recalls. Sometimes when he just flew back to his cage top perch after feeding on mash, I would do recalls that he responded to even though I thought he might be full after just eating. On 5th January his weight was 184 grams. I will try an experiment on him over the next week. I will allow him free feeding of mash, as much as he wanted to eat. All to be recorded. I will weigh him each morning as matter of course. And we will see if he will eat and eat and become a beach ball or explode with spleen and guts spilling out of him, or until he eat us out of house and home. Or if his eating will stablized and he remaining still alive and not keeled over. Earlier this year, I went with my wife to this musical show Wicked at Marina Bay Sands in Singapore. I cannot tell you much of the show as most of the time, I was sleeping in that show. Must be the peasant in me as I cannot dream of invoking shades of Emperor's New Clothings on that production. I just was not enamoured of that show and I decided sleeping through most of that was better, as long as I did not snored. Some time long ago, I attended a Japanese Noh play. I went there with anticipation. During the play, I waited with even greater anticipation for the interval. Where I gladly departed never to return again. I then knew some Japanese where I told them of that. They all had a good laugh and assured me that even they themselves could not handle a Noh play. But as said, it was the peasant in me. On the way to Wicked, we passed by a show gallery of the works of Liuli Gongfang or Liuligongfang (琉璃工房). 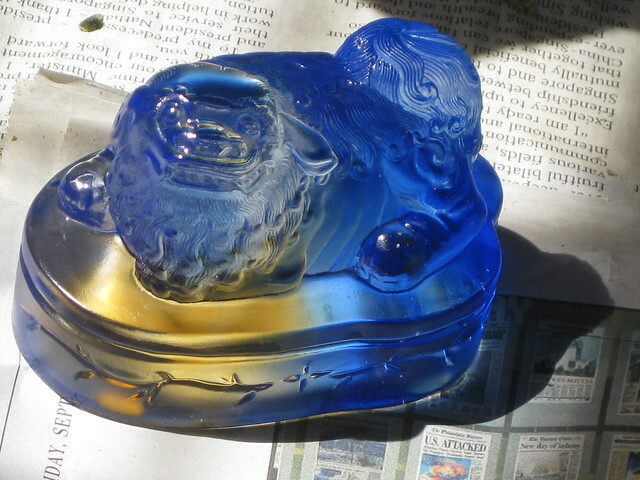 The discovery in 1968 of the tomb of Liu Shun, a nobleman from Man-Chung County in Hopei Province, unearthed the earliest recorded example of pate-de-verre. A glass ear cup was found behind the renowned "jade suit with gold thread." 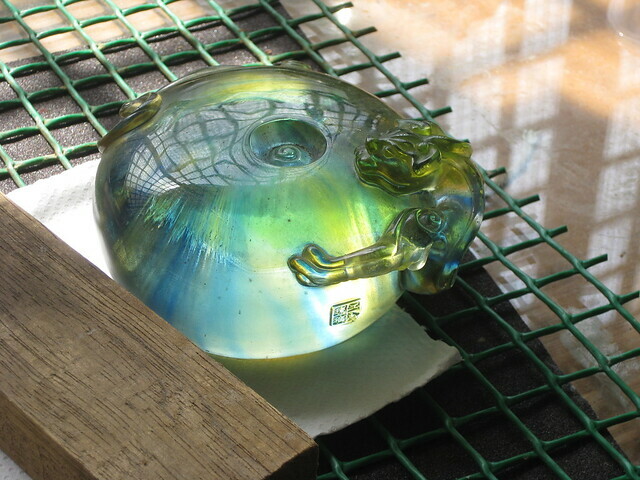 Archaeologists confirmed the glass material was of Chinese origin, indicating the pate-de-verre technique was indeed indigenous to China. Those liuli pieces were just beautiful. Do a Google image search for Liuli and you will see that. And I do have liuli pieces at home. Started when I was in Taiwan long ago and into drinking Chinese tea ceremonially. I even had a charcoal blazier to boil the water with and not new fangled electric kettle. 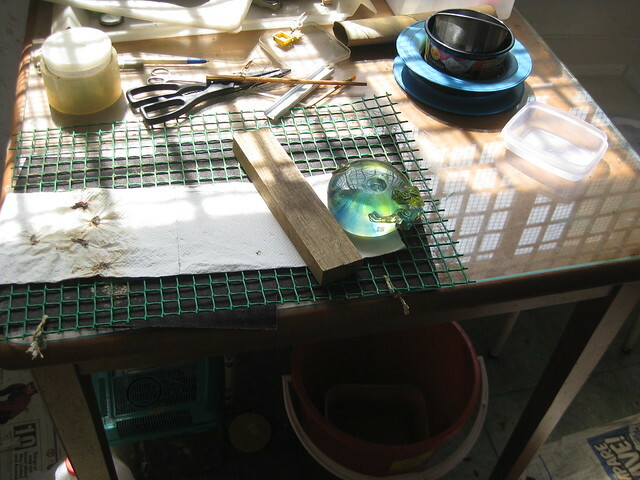 And in that setting, the Liuli pieces were on the table with traditional Chinese tea making set to be admired together with sipping Hei WuLung tea after ritually preparing the tea. In fact, you all have seen those Liuli pieces in earlier photos. Except you had not known those were Liuli pieces. Those pieces were put to use their creator had not dreamed of. I know. As said, its the peasant in me.